(return to top of page) Many modern words in general use as well as medical vocabulary are derived from Latin or Greek roots. 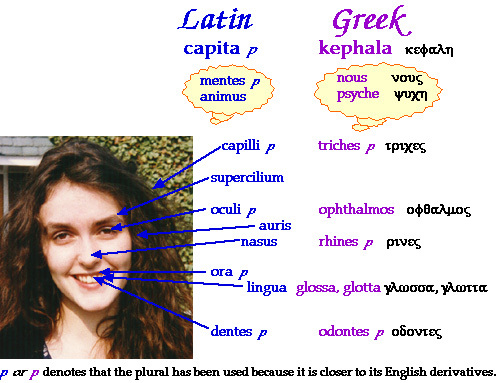 Notice with the Greek words that sometimes k is transliterated to 'c' and the Greek h can be 'a' or 'e'. Think carefully about your answer, use the clues in the 'mouseover' box and then click on the 'check your answer' link, which will give you more information. 1. The Greek word for 'straight' is 'orthos'. What is the name of a professional who aims to make your teeth straighter? 2. A linguist is someone who enjoys languages (from the Latin word for 'tongue'). Using the Greek word, what is the name given to someone who can speak many languages? Clue : The Greek word for 'many' is 'poly'. - and what is the name of a list which explains or interprets words? - and where is the 'epiglottis' and what is it? Clue : The Greek adjective 'plastos' means 'moulded, formed, sculpted, shaped'. 4. Trichology is the study of what? Clue : Derivatives of the Greek 'logos' (word, speech, reason) mean 'study of'. 5. A Capillary is the smallest type of blood vessel. Why do you think it is so called? 6. The initials of the dreadful disease BSE stand for Bovine Spongiform Encephalitis. Which word tells you which part of the body is affected? Clue : Bovine comes from the Greek and Latin words bous / boves, which mean 'cattle'. 7. Why is 'Capital punishment' so called? 8. What is the difference between an 'aural' test and an 'oral' test? 9. What is an Ophthalmoscope used for? - and what does an architect mean by an 'oculus'? 10. What is the meaning of 'psychedelic'? Clue : The Greek word 'delos' means 'clear'. - and I can't resist this bonus question! How might you describe an arrogant person? Clue : someone who arches their eyebrows at you! Congratulations! You have finished the quiz. An Orthodontist will care for your teeth. 'Dentist' and 'dentine' (the substance which makes up the bulk of the teeth) are derivatives of the Latin word 'dentes'. A Polyglot is someone who speaks many languages, and a Glossary is a list of words. The Epiglottis is a small flap of skin in mammals which hangs above the tongue. It closes the entrance to the windpipe (larynx) when food is being swallowed to prevent choking. The Greek word 'rhines' means 'nostrils' and a Rhinoplasty is an operation to re-shape the nose. (Perhaps you can work out how 'plastic' got its name). Derivatives like 'nasal' from the Latin word for 'nose' are easier to spot! Trichology is the study of the hair. A capillary is so slender that it is considered to resemble a hair. Encephalitis refers to the head. Capital punishment means the loss of life, or head. An 'aural' test is one of hearing ('auris' is Latin for 'ear'), whereas an 'oral' is to do with speaking or singing, from the Latin word for 'mouth'. An Ophthalmoscope is for examining the eye. An Oculus is an architectectural term for a round window - round like an eye. Psychedelic means 'clear-minded', but it can also refer to something which makes the brain perceive colours very brightly, or to a clear, bright colour. You can see derivatives like 'mental' and 'animated' from the Latin words for 'mind' and 'spirit' but it is interesting that the Greek 'nous' is now a colloquialism for common-sense! Supercilious means haughty or arrogant.